A simple offline sat nav device for the car that's very capable but could do with a graphical overhaul. Keep it simple. This is now the prevailing mantra in the sat nav market and that's fine by us. It's also exactly what Garmin's new nuvi 58LM is designed to do. This isn't a fancy pants multi-purpose device. It's not meant to wow you with size or slickness or features. Instead, it is meant to do an efficient and effective job for a reasonable price. That job, of course, is navigation. Inevitably, the main problem devices like the 58LM have is competition from smartphones. Almost everyone has a smartphone these days and they pretty much all come with some kind of navigation for free. What they don't have as standard, arguably, is navigation that's fully optimised for cars and has been honed over many generations. Yes, you can get paid-for apps that tick those boxes. But for some, a semi-permanent and dedicated device is preferable to whipping your smartphone in and out of the car. And it's in that context we'll consider the Garmain nuvi 58LM. The Garmin nuvi 58LM is a five-inch device (there's an equivalent 68LM for those who prefer a larger 6-inch screen) with a very modest 480 by 272 pixel display. It's also a resistive rather than capacitive touchscreen, the latter now being the done thing in smartphones due to superior response and accuracy. As standard it comes with full European maps and free lifetime updates. What it doesn't have is any networking or connectivity, be that cellular, Wi-Fi or Bluetooth. It's a stand-alone, single purpose, offline sat nav. Not that this is a huge surprise given the relatively low price point - £89.99 / $145 (around $AU180). It comes with the territory. Most notably, that means no live traffic data, which will be a deal breaker for some. However, Garmin has come up with a neat solution to the the nuvi 59LM's offline limitations. It has a built-in point-of-interest database supplied by Foursquare which you can update whenever you like by plugging the device into a PC. The same goes for the 58LM's speed camera database. It's stored locally and you simply drag it in from the car occasionally to update the database. That's a clever way to go about things, we reckon. Obviously the database's won't be completely up to the minute. But you get the vast majority of the benefit without the cost and complexity of the data connection. Apart from all that, there's the usual suction-secured mount and a 12v car power socket adapter. Oh and the device also supports Garmin's wireless reversing camera. We'll make no bones about it, the screen isn't the Garmin nuvi 58LM's greatest feature. In an age of uber-resolution smartphones, the 480 by 272 pixel resolution of the 5-inch display is borderline comical and results in the kind of coarse image quality you might have thought disappeared years ago with the demise of devices like PocketPCs. The interface and maps won't be worrying the likes of Apple for sheer graphical beauty, either. That said, none of this really impinges on functionality. It's bright enough and vibrant enough for legibility. Maybe that's all that counts? If we do have problems with the visual aspect, it's the logic of the interface and the quality of the mapping. By way of example, to bring up a list of local petrol stations, it takes three finger jabs compared to just two for the latest TomToms. And TomTom gives you the results as points on the map, where Garmin serves up a text list. Ideally, you'd be able to choose. But we think the map option is usually far preferable for making a snap decision on what is most convenient. The closest option isn't always most convenient, that's the problem with the text list. That said, the newly simplified search function makes it easier to just punch in where you want to go without the need to drill down through umpteen menus to find the right field to input cities or postcodes or, well, whatever. The mapping and routing, meanwhile, are essentially carried over from other Garmin devices. That puts them among the best for accuracy. However, the visuals are pretty harsh on the eye and occasionally not the easiest to digest at a glance when actually driving. It's a marginal thing and the functionality is all there, including full postcode support. But we prefer TomTom's latest maps for ease of viewing and comprehension. It's probably time Garmin overhauled its graphical guts. Actual CPU and graphics performance is pretty poor, too. 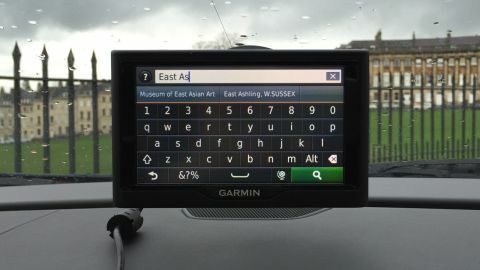 This is a common sat nav problem and far from unique to the 58LM. We've just tested the top-end TomTom Go 6100 and that's just as bad. Garmin's cheaper sat navs have essentially become the Ronseal of navigation devices. They do what it says on the tin. The Garmin nuvi 58LM is no exception. It's far from exciting. And it's short on some of the more useful features that come with a data connection, which it conspicuously lacks. But that goes with the territory at this price and the 58LM is undoubtedly a very effective device for getting you from A to B. It's affordable. It's no nonsense. It will get you places. The Foursquare POI and speed camera databases are nice little extras, too. And Garmin's mapping and guidance remain highly competitive. The screen is very low res, the graphics ain't pretty and there's a fair amount of ugly going on. Even then, the CPU struggles to cope. Lack of connected features like live traffic will be a deal breaker for some, even if it's not a realistic option at this price. Oh, and the power adapter is rather ungainly. At this price, you need to keep your expectations in check. HD screens and all manner of streaming data features are simply not going to happen. But if you want a simple offline nav device for the car, you could do a lot worse. We just wish Garmin would give its graphics a bit of a polish.